Forty years ago today, on July 20, 1969, the world watched as the crew of Apollo 11 took the first human steps on the surface of the Moon. In celebration of this historic occasion, Google is launching Moon in Google Earth, an interactive 3D atlas of the Moon, viewable with Google Earth 5.0. Moon in Google Earth was announced today at the Newseum, in Washington, DC, where Apollo 11 astronaut Buzz Aldrin, Google Senior VP of Engineering Alan Eustace, NASA Deputy Administrator Lori Garver, A Man on the Moon author Andrew Chaikin, and space tourist Anousheh Ansari delivered remarks. With Moon in Google Earth, users can explore a virtual Moonscape, follow guided tours from astronauts Buzz Aldrin (Apollo 11) and Jack Schmitt (Apollo 17), see the latest rover concepts by teams competing in the Google Lunar X-PRIZE, view high-resolution ‘Street View’ style panoramic photos, watch previously unreleased video footage captured from the lunar surface, and much more. Moon in Google Earth will also incorporate a complete lunar terrain data-set by Kaguya LALT, produced by JAXA / NAOJ, which will serve as the atlas’ base-map. Whether they are rediscovering the iconic moments in the history of Moon exploration or learning about them for the first time, Moon in Google Earth enables users to better understand the Moon, and our relationship to it, with an immersive, 3D experience. 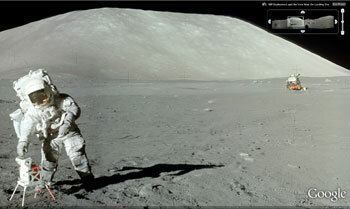 The most recent tool to have been developed as a result of the Space Act Agreement between Google and NASA, Moon in Google Earth enables information about the Moon to be accessible to anyone in a unique three-dimensional context. Spacecraft Imagery – View selected imagery captured by the Apollo Metric Camera, Clementine, and the Lunar Orbiter. Apollo Missions – Travel back to the Apollo era and discover the landing sites of Apollo missions 11-17. Explore “Street View”-style panoramic images, watch previously unreleased footage from Spacecraft films , and read about the places astronauts saw on their trips to the Moon. Guided Tours – Take a narrated tour of the Moon from Apollo astronauts Buzz Aldrin (Apollo 11) and Jack Schmitt (Apollo 17). Historic Maps – Discover Apollo-era geologic and topographic maps of the Moon that were used in mission control for trips to the Moon. Human Artifacts – Learn about the various types of exploratory equipment that humans have left on the Moon and where those objects can be found today. Artifacts from the United States, the Soviet Union, China, the EU, Japan, and India are included, some of them as 3D models. To experience Moon in Google Earth, open Google Earth 5.0 and switch modes from “Earth” to “Moon” on the top toolbar. To learn more about Moon in Google Earth, visit earth.google.com/moon. Google Earth 5.0 can be downloaded at earth.google.com.